Shortlisted for the Stanford Dolman Travel Book of the Year at the Edward Stanfords Travel Writing Awards 2016. The line from London to Bristol connects two great cities, but what lies in between? London's western suburbs, the Thames Valley, acres of farmland punctuated by tourist traps and provincial towns; what could possibly be of interest in such a landscape? 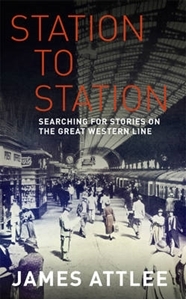 To his surprise, James Attlee - a regular traveller on the route - finds himself knee-deep in stories, the line awash with ghosts, including those of Charles I, Oscar Wilde, T.E. Lawrence, the Beautiful Spotted Boy, Haile Selassie, Stanley Spencer, Diana Dors, Eddie Cochran and of course the creator of the line himself, Isambard Kingdom Brunel. Among the living he seeks the stories of the overlooked workers who keep the trains running - including the man who flies an owl to scare the pigeons out of Paddington station. Drawing on his own experience as a commuter Attlee explores the effect of velocity on vision, and the links railways have with music and literature. Despite the ease with which it slips backwards and forwards in time, this is not another nostalgic book about 'heritage' England. As Britain embarks on the greatest period of rail construction since the nineteenth century, the author argues that trains are the future, not the past. Will increased connectivity really guarantee general prosperity this time around, as Victorian engineers promised it would 175 years ago?